Well we've started the second battle of the Alpian Wars mini-Campaign. Alpia won the Battle of the Crossroads and now, with reinforcements, is thrusting into Stagonia with the intention of making it through the Bellevue Hills into Stagonia's rich wine country. General Murdeau, also reinforced but with a somewhat smaller force is trying to prevent this. So far we've had a number of simple "march moves" and now three "Deck Moves" (where I use the Action Deck described in Clarence Harrison's "Victory Without Quarter" rules which we are using for the 16th century, not the mid-17th). The Bellevue Hill passes are well to the right of this line of trees but Stagonia seems to have chosen to fight a delaying action here. 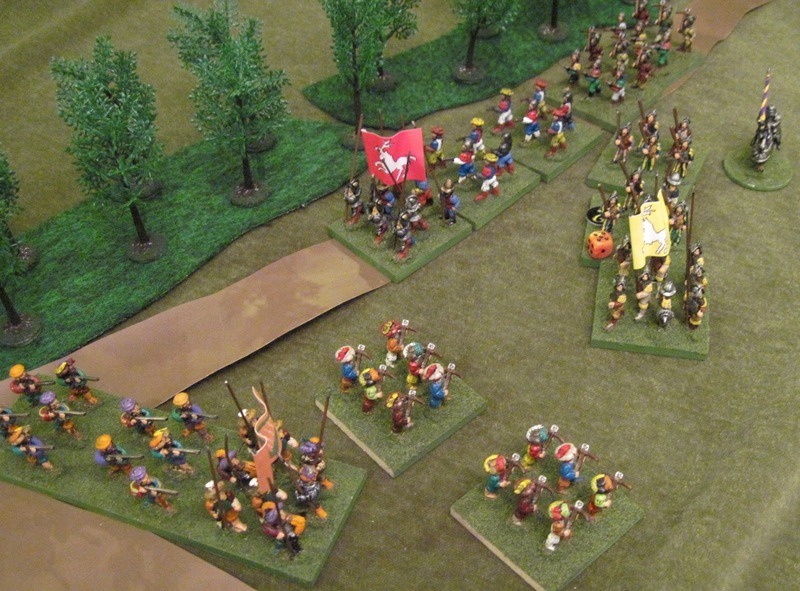 The Alpian forces are attacking from the West (left on the photo) in a pair of columns. For much more, I urge you to visit "The Alpian Wars" blog . . . we seem to be getting some moves in most every day now. Happy to be taking part in something that gets your energy up Jeff!